This is in many ways a more complex subject than the two forms of outdoor vivaria. It would be completely impossible for me to cover all forms of such vivaria but there are some important general guidelines I can give. With many people, their indoor vivaria are highly artificial whereas I tend towards the naturalistic approach with most of mine. I would, however, stress that the totally artificial approach, if properly done, still leads to perfect animals and successful breeding. I am more fortunate than many people as I have the space to build a small number of moderately large "walk-in" vivaria. The design considerations for these are somewhat different to traditional smaller vivaria so I shall deal with them firstly and then move on to the remainder. It is safe to say that vivaria such as this can be much the same as covered outdoor vivaria and range all the way to little more than extremely large conventional vivaria. In my case, indoor vivaria are used almost exclusively for sub-tropical and tropical herps so one of the factors to be taken into account is heating. Given the extent of my facilities my reptile room uses gas central heating for background warmth and in the case of the large vivaria this is the primary heat source (well, after the sun!). Each of the four vivaria thus has a radiator which is fully enclosed. There is a mesh heat outlet towards the top of the enclosure which is itself about 30 cms deep and provides a basking platform. Various levels and planters are built in using lightweight blocks which are chiselled into a rough shape and then receive a coat of render to make them look more rock like. All of the vivaria contain ponds and running water which reflects the requirements of most of the animals that live in them. They are built using two skins of lightweight insulation blocks (a single skin on internal walls) and roofed in the case of three with twin-wall UV transmitting acrylic sheet. The fourth utilises twinwall polycarbonate but is supplied with an extremely efficient mercury vapour UV basking lamp. In terms of planting, they vary from one which is planted with Scindapsus and Passiflora and which generates two to three sacks full of excess plant waste every month through one with a Ficus and small Scindapsus to a couple which are devoid of plants. All of them are well provided with shaded cool caves for the animals to take shelter in when it becomes too hot together with branches to climb and bask on and to give easy access to the various levels. 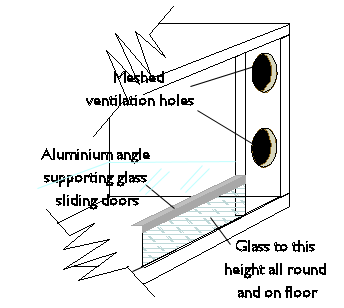 In addition there is a roof mounted vent covered with mesh which is fitted with a temperature controlled opener although in the summer months this tends to be open all the time. Fresh air is drawn in from outside via ducting into the heater chamber thus ensuring air circulation and freshness. Lighting consists simply of ordinary domestic fluorescent tubes provided more for human benefit that the animals. Since the vivaria receive the full benefit of daylight this fully meets the animal's needs. As mentioned the vivaria have background heating supplied by radiators. These are regulated through two thermostats which are switched via relays to allow differing night and day temperatures. They are also changed seasonally. At any time of year, the heating can actually be off (due to the thermostat) as the sun alone, even in these northerly isles, is enough to maintain, indeed exceed, the minimum required temperature. More detail of how this is achieved can be seen under the "Heating and Lighting" menu option which is, in any event, the next section linked below. The benefits of this form of vivarium cannot be overstated. Despite high initial outlay and heating costs the benefits in the health, behaviour and breeding with many allegedly difficult species more than amply repay this investment. These can take many forms and for those who do not suffer my predilection for DIY there are a lot of excellent designs available to be purchased. Probably the only general rule is that with very few exceptions an aquarium tank is wholly unsuitable. The exceptions relate mainly to wholly aquatic species or life stages. In my case this means the only use of aquaria is for the occasional rearing of tadpoles. Size. Obviously this can be hugely variable according to the requirements of the animals kept in them. But, if there is a single problem to be avoided, it is making vivaria undersized. Although I only have snakes as occasional visitors I will nevertheless not keep any save the most lethargic in a vivarium with a principle dimension less that the length of the snake. With lizards I aim for at least two dimensions at least twice as long as the lizards. Whether the additional size is in a vertical or horizontal dimension depends on whether the lizard is primarily terrestrial or arboreal. I keep mainly small species or young lizards in my indoor vivaria and as a consequence they tend to be between 75 cms and 120 cms long, between 30 cms and 60 cms deep and between 30 cms and 90 cms tall. Materials. A popular choice is melamine coated chipboard which provides a solid structure which is easily cleaned and proof against a small degree of humidity. Glass and plastic sheeting is also used as is fine mesh. Again, the choice of material is greatly influenced by the planned occupants. With any species requiring high humidity the melamine is a non-starter as water will very quickly permeate the joints and cause it to swell, weaken and eventually disintegrate. A melamine coated chipboard box with glazed fronts sliding in runners and meshed ventilation holes at the front ends. They are then lined with glass held in place and joints sealed with silicone sealant. This glass covers the entire floor and reaches about 75mms up the sides and ends. This increases the tolerance to humidity particularly in the substrate so knocked over water bowls and the like matter little. All exposed edges of the glass are made safe by a brisk rub with a silicon carbide or similar stone. I have a further vivarium which houses Uromastyx geyrii. These are very much a specialist's lizard and require very special conditions. I do not pretend to be an expert in any aspect of their husbandry but learn myself from someone who IS and expert - my very good friend Terry Thatcher. You can learn about housing and keeping Uromastyx on his website at http://www.captive-bred-reptiles.co.uk. All mesh vivaria supported by aluminium framing. In my case I make a shallow glass box to fit in the bottom which contains substrate and or water as appropriate. Such vivaria are superb for animals that require very high levels of ventilation. The basic vivaria are readily available commercially and I use Rep-Cage produced by Terry Thatcher. It is important that this be addressed. Mainly this means that the vivarium must be easy to clean. This is one of the factors determining the materials and constructional techniques used. With naturalistic vivaria it is possible to get the internal balance so effective that cleaning is infrequent and minimal. But, even by careful design this is hard to achieve and requires a significant element of luck. In any event, should you be unfortunate enough to get an animal that is harbouring disease you may well find it necessary to remove and destroy everything within the vivarium. In such cases you also need to be certain that the vivarium can be totally disinfected which is where non-absorbent surfaces such as glass and plastic sheet come into their own. This is a complex area and receives its own section. Nonetheless it must be borne in mind at the vivarium design stage. As ever, the objective is to emulate nature as well as possible. In order to achieve this, light sources should be broad spectrum. In particular the use of day light tubes and/or UV lighting is essential for most species. In addition, heat sources may well have to be regarded as a separate issue. While the lights can be controlled via a thermostat (and, in fact, should be in order to prevent overheating) it is undesirable to have the animals frequently plunged into darkness during the day. The lighting should represent a day/night cycle. Fortunately this can usually be resolved by remembering the need for a temperature gradient. In other words the temperature should vary throughout the vivarium allowing the animals to move from hot to cooler areas to regulate their own body temperature. This means that heat sources can be concentrated towards one end of the vivarium and a single thermostat set at the average required temperature. Most species are fine at normal room temperatures overnight but, their requirements must be established and both the vivarium location and heating should reflect this. Beware of putting vivaria in the sun even through a window. This can lead to drastic overheating. Good vivarium design can prevent this, in which case the availability of natural sunlight even through glass can be beneficial. 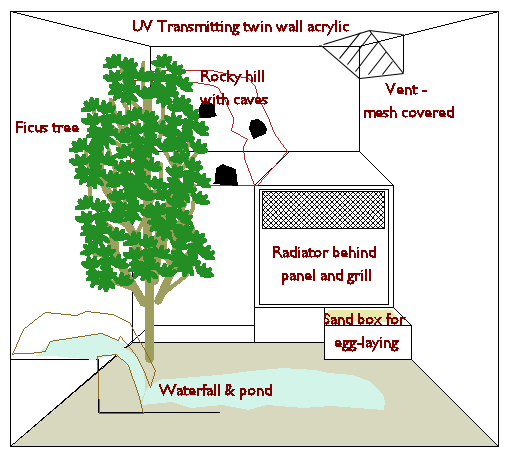 Many people use wholly artificial substrates, planting and retreats for their animals. Certainly this seems to work well enough. I prefer, whenever possible, to use natural materials or a mix of natural and artificial materials to reflect the habitat of the animals. At its simplest this can involve a layer of gravel together with hiding places constructed from terracotta flower pots cut in half longitudinally. Other vivaria use sand and peat allowing burrowing, others simulated rock formations using mortar over expanded polystyrene formers often with caves let into them. Several vivaria house semi aquatic species. These also contain planters with gravel overlaying peat. With water circulation and air pumps the water remains crystal clear (one of these vivaria has never needed a water change in 15 years). In fact, the only significant maintenance problem has been the frequent necessity of cutting back the Scindapsus growing in it. One thing every vivarium has in common is a number of secure retreats where the animals can hide completely. Obviously it is beneficial for this to appear decorative but it is much more important for the animal's welfare. I have found that even scatterbrained species quickly settle and remain prominent of they know they have a secure retreat where they can hide. This is again worth mentioning. Most of us at some time or another have found it necessary to have a vivarium actually in the house. Careful choice of constructional materials and decor can ensure that it is every much a thing of beauty as a well maintained tropical fish tank. Once again - this can help persuade the household authorities!